Along the center stretch of Florida’s panhandle, right on the coast, cuddled up beside a dark and warm lake, is a tiny beach town that has existed, in one form or another, since the turn of the century. I have known this stretch of the earth for 41 years, since almost the day I came yawning into the world. And while I’ve lived in many cities, towns and neighborhoods, this little stretch of pine, sand and lazy memories is the closest thing I’ve ever known to Home. painting the deep aquamarine colors of the Gulf of Mexico, or the foamy sea-spray crashing onto brilliant white sand. No, I added very little to the beauty and history of this place. The tracks I made through the back dunes were always quickly filled in with Gulf-blown sand, and the few fish I managed to catch there were easily replaced by larger and smarter specimens. I left along these shores only a few parts of my fragile and impressionable heart, a possession less substantial than a footstep. But I took with me from those dunes and streams such a deep feeling for the flow of the earth and sea that occasionally, when I’m half-dreaming, or distracted suddenly by a warm breeze whispering through some half-opened window, I can still smell the sour odor of mullet under my fingernails and salt water drying in my hair. A few hearty settlers first cut out a yard in these thick forests just before the turn of the century. Major Charles T. Gray built the first structure in Grayton Beach that amounted to anything (the Washaway Hotel, so named because it was nearly washed away during a hurricane) and provided the community with a name. Billy Bowlegs, the Pirate, was supposed to have visited the area and the older locals, those who could tell you the truth about when to eat oysters safely, board up for a storm, or where to drop a trap for blue crabs; well they’d tell you, if you could pry it out of them on a warm cricket-filled night, all about the secrets of Billy Bowlegs and the buried treasure; but they were taciturn folk and suspicious, and prying a secret from their lips was more difficult than prying open a fresh Western Lake oyster with a thumbnail. Recently Grayton Beach, Florida has been touted by some Professor at Maryland (who’s supposed to know about such things) as the most beautiful beach in America. I haven’t kicked a single broken shell on any of the other beaches on his list, nor watched the moon rise like a mirror over their distant fog-shrouded tarns, and so I can’t tell you what the Professor really knows about such things. I can only try to tell you how it was for me to be in this stretch of the sand and sun, growing up, learning about love, adventure and beauty from one of nature’s finest teachers. Part of the beauty of any beach town is the people who inhabit it and when you are young and impressionable all members of the female gender walk with sand-chiseled grace and symmetry; they are the most beautiful of all the beach-side creatures. I met a hundred ladies along these shores, and admired a thousand more, but the beach herself, in all her danger and glory, remained the only girl I could always count on. I remember at least four sisters – blond as sea oats and almost as thin – that grew up with me every summer in Grayton Beach. I knew them the way I knew every other face, as a passing memory which you might not see at all during the next summer, or perhaps only for a few days. I watched the girls bathe in the warm reaches of Western Lake where it pushed out through a narrow sandy pass to within spitting distance of the Gulf (the lake was not yet full enough to open up, any fool could see it’d be at least another week and a half) and on many a warm summer night I admired their sleek forms as they chased their old collie across the wooden floor of our beach-side hangout. Half-rusted ceiling fans would blow a light breeze through their straight, sun-streaked hair and the girls would shriek as they raced on, no destination in mind. And then I watched from afar as these thin, impressionable girls became women and, one by one, wives. I found out, when I was much older, that one of them thought I was cute; but I hardly ever spoke to any of them. I was way too shy, they were far too adorable, and my ambitions to catch the last wave of the day, search out the highest dunes, lead the latest expedition around to Miller’s Cove – or perhaps catch a card game at Holman’s Hangout – in any case there were a 100 reasons I could give for admiring their beauty from a safe distance. Such was typical of my forays down the shadowy trails of romance at Grayton Beach. There were many families like mine that spent great stretches of time there. We came to know their sunburned faces well, and even those folks that you never really met always seemed like old friends. They’d always smile at you when you passed them on the way to the beach, or when you met them at the community mailbox. We’d nod at each other and wink, as though we shared some delightful secret. And, of course, we did. My grandfather was in the construction business and along with his sons and daughters he built the house I often call my own back in 1956. It was – and is – a sturdy two-story structure made of rough, gray concrete block, rising up through the midst of a tangle of twisting, scrub oak. It never was a beautiful building, too plain and squared off to catch a painter’s eye, but it was big, solid and quiet. Throughout my youth more times than not there’d be three or four families staying there, with dozens of kids racing through the hallways and up and down the stairs, yet you could always find a room to close yourself up in when you needed a little idle reading from the cheap paperback novel you’d come across in the musty chest of drawers where you’d unpacked your undershorts. Almost all of the original beach homes in Grayton Beach were constructed of wood, with wide porches spread out toward the ocean, the lake, or the front door. Dark and quiet dwellings, backed off from the four dirt roads that define Grayton Beach as if they held their own quiet secrets, the cottages seemed too unwieldy to withstand the many violent storms which the Gulf can deliver. Yet every one of these little homes still exist. I know them all, many of them inside and out, and I could paint you a picture right now of every one of them. Except, of course, I’m no painter. For most of this century Grayton Beach has remained a quiet, undiscovered place. Change and progress made their way slowly into the area though most of my childhood. Years might pass without the addition of a new home or a paved road. But Grayton Beach is no longer undiscovered. People with Real Money are building second and third homes everywhere. It used to be you’d have to drive five miles to buy fresh milk. The closest restaurant of any kind was Chapman’s, a fried seafood house across Choctawhatchee Bay that sat about eighty people on a good night. Now there’s at least four nice restaurants within walking distance of our house, including a Creole-style concept with white tablecloths, tile floors, fine wines and five-star recommendations (Criollas). A new subdivision is growing rapidly through the dunes to the west and five minutes away in any direction you’ll find fresh seafood, imported beer and lottery tickets. Our place is still on Western Lake and the lake is still scenic, but you don’t see the mullet jump like you used to – four, five, six times in a row, silver scales reflecting in the noonday sun – and all the catfish have long since died off. I’ve seen eight-millimeter films of myself as a two-year old, playing with my cousin in the dark, shallow waters. I literally grew up in that lake. If I were to pull a seine net along any shore right now I could probably count out every species of life that no longer would be found flipping wildly in the net. This is the price, I suppose, of progress. Just up the road in the past few years they’ve developed a place called Seaside, which the developer says models its homey architecture on the breezy old homes of Grayton. Seaside is a striking and beautiful beach-side community, with pink brick streets and pastel-colored homes. Inventively angled and stair-cased, the cottages have numerous porches and balconies, perfect for enjoying the Gulf view and a Margarita. At the end of each block are a couple of trees, a roundabout and a cul de sac. There’s several wonderful restaurants and a small, artsy mall where jazz musicians may be heard playing on any Saturday night during the tourist season. It’s a popular place to stay if you have money and you’re trendy. We drive by there all the time these days and watch the Yuppies, the Nouveau-Riche and the Wannabes, and we admire their sleek forms and shake our heads. No one in our family will probably ever be that trendy or rich, but we’d never be envious. We grew up in Seaside, when it was just woods and wild hogs. There are so many stories from The Beach, as my family always called it, that one doesn’t know where to start. But perhaps a few quick tales will help to fill in some of the undeveloped corners of the picture. At The Beach we had a place called The Store. I guess it was built and first opened in 1939, but for many of us the place had been there forever. For those us fortunate enough to grow up there The Store was as much a part of Grayton Beach as was the sand and the Gulf. When The Store was in its prime – I’d say almost the entire decade of the sixties, and a good half of the seventies – it presented a slice of Americana that is slowly and surely fading into extinction. The Store went through several evolutions during its era, but I think we all remember most those times when one half of the old, high-raftered place sold overpriced and undersized staples, fishing tackle, ice cream sandwiches and, of course, cold beer, while the second half of the leaky-roofed structure housed a spacious wooden floor, supporting numerous high-backed wooden booths, pinball machines and pool tables. (Now houses The Red Bar). From each booth you could sit back and sip on your beverage of choice and keep a careful eye on every visitor that might wander through the flapping screen door, or perhaps turn your eye outside, through a half-torn screen window, where you could hear the ocean rolling in quietly, and watch the sea oats wave in the breeze, and spy on the occasional pair of lovers that walked hand-in-hand toward the Gulf. Two or three pinball machines lined one wall and a jukebox kept the room rocking from the corner. Someone, sometime, began a ritual at The Store of carving or spray painting one’s name, initials, hometown, university or valentine on any wall, ceiling, floor, or other exposed surface that seemed handy. If the original owners of The Store had ever objected to these practices they must have resigned from the battle quickly, for every wood surface of the place was covered twice over with these tattoos. Every scrap of wood at every booth was carved up. The Store must have been made of some stubborn timber, for I can’t remember any of those booths ever falling apart. There were several cousins in my family who had the same initials as myself and probably all of us left our mark there somewhere, but I could never remember which one was mine. The Store was The Beach, because that’s where the action took place. That’s where things got most adventurous. It was a small beach town with just a few dozen families, but the locals from the nearby towns always came down to visit on the weekends, with their hot rods and attitudes, and on a warm Florida evening, when the Gulf is crashing at high tide in your left ear and the Rolling Stones are screaming “I can’t get no . . . . satisfaction!” in you right, and that girl that you kicked sand dollars with on the beach earlier during the day has just walked in with two friends even lovelier than her, popping their gum and straightening their cutoffs, well, there is only one place on this earth to be. At The Store. I played pinball at The Store when I was a kid. I was obsessed with the ring of the bells and the knock of the Free Game. You could get three games for a quarter in those days and if you were good and knew when to shake it and when to flip it and when to tag the Eight-Ball flag when the Double -Special was lit up, you could really ‘beat the machine’, unlike today’s games which are filled with a thousand lights and sounds, but require a zillion points for a free game. Many times we filled up the replay counter and ‘turned it over’. “Ssschnoooock!” Hah! A match. Sometimes they’d run us out of there when The Store closed and we’d have to wait on the doorstep the next morning so we could play off the games still registered on the machine. The Store anchored the dreams of every young person lucky enough to spend much time there. The summer after my freshman year in college I spent two weeks in Grayton Beach with two of my best friends. It turned out, the second week we were there, three young debutantes from Alabama showed up. Almost every night we saw them at The Store, ready to dance to ZZ Top or David Bowie, if only they could find a partner. The Store was certainly past its prime – the age of the big discos had erupted along the Florida coastline, as it had across the rest of America – but for me, The Store was still the best game in town. We wore tight jeans and T-shirts and we knew all the tunes, but only one of us was cool enough to make the grade. His last name was Hamlett and he was a pensive and poetic soul who smoked Marlboros and combed his dark hair straight back. She was blonde, and slim, and a great dancer, but Hamlett was much too shy. When she asked him for a light he missed his chance. We talked to them, flirted with every new breeze, and tried our best to dance, barefooted and tipsy. But we never kissed. I can still see them leaning over the jukebox to pick out a song, their bare feet rubbing across the sandy wood floor. They knew we’d never see each other again and they knew for sure that we were interested in only one thing. Not to be. I suppose. That is but one person’s tale of The Store. Everyone has their collection. There is something about a beach town that fills the air with innocence, youth and romance. Perhaps it has something to do with so many visitors miles away from their ordinary duties. Perhaps it is the warm air and the undersized beachwear. Perhaps it is the incessant cry of the ocean carried on the ocean breeze, filling the air with the infinite dreams and possibilities of the planet. Times have changed. Grayton Beach, Florida, like hundreds of beach towns along America’s coasts, used to sit in the middle of an undeveloped wilderness. There are fresh water springs all along this stretch of the Panhandle, which meet with the tides of the Gulf of Mexico to form brackish water bays, estuaries and lakes. When the rich minerals of the sea mix with the fresh, earthy springs of the inland it tends to harbor a harsh and hearty collection of flora and fauna. There were large alligators at one time roaming these lakes. The 14-foot hide which used to hang from a tree across from the Miller’s old home lay ready evidence to this fact. Even in my day, however, you could find yourself face-to-face with more than one of these shy reptiles. On one ill-advised expedition my cousin and I decided to paddle on a surfboard across the lake into a narrow channel in the marsh. Just as we rounded a turn we found ourselves looking across a scant fifteen yards at two large eyes and a snout protruding from the shallow, black water. We backed out of there quietly, under the reptiles’ watchful eye. Nobody was looking for trouble on that lazy afternoon. Another time I was treading water just off the end of our dock, trying to cool off from the mid-afternoon sun (even though the lake water was often was warm as a bath) when suddenly my buddy jumped up from the bench hollering, pointing to an alligator. I leapt from the water onto the dock in what seemed at the time a single movement. But it was a harmless ‘gator, only about five feet long, the one my grandfather had named Jack Daniels. Ol’ Jack backed away from us cautiously, eyeing us both with an amused grin. I’ve known kids who were bitten by water moccasins in that lake, and seen a few moccasins myself. My cousins delighted in killing rattlesnakes whenever they came across one. They’d drag it, headless, down to the dock, for a proper skinning. I’ve heard the sounds of wild boar running across our back yard in the middle of the night, tripping the bell-rope that our Grandfather had set up. Of course he’d grab up his old shotgun and, in his boxer shorts and robe, wander to the edge of the woods looking for the rascal. Thin, barky pines grew out of the sandy soil, surrounded by palmetto bushes with fronds as sharp as saws. Needle-grass ringed much of the lake, with needle-like points at the end of each reed, on guard to turn you into a sieve if you accidentally fell into them while fishing, prospecting, or water-skiing. You could catch your foot on any number of snares: small cactuses which grew everywhere from the beach back through the woods; spurge nettles, the plant we called the ‘itchy-bitchy’ (a small white flower with raspy leaves and poisons that could infect an unsuspecting wanderer with a two-hour itch); or perhaps you’d step into a collection of dried out sand spurs and spend the next twenty minutes extricating your feet. Western Lake, which establishes the eastern boundary of Grayton Beach, is a dark lake, the color of tea, and the bottom is made up mostly of black, gushy mud, hiding blue crabs, shrimp, barnacles, old motors, and oysters with edges sharper than razors. Almost everybody I knew could display one or more proud scars from a careless encounter with a Western Lake oyster or a barnacle, or a half-rusted tin can. Because the lake opened up to the Gulf every month of so, the dangers of the sea would often drift in with the tide. I’ve witnessed small sharks swimming into the pass from the Gulf, and once I made the mistake of gigging a leathery stingray along the lake shore at full moon. The catfish that used to inhabit the lake were a nasty strain as well. One time I stepped on a dead cat lying upright on the dock. It took half a minute to sling it off my foot, and I remember yelping in pain as I hopped up the hill toward the house where my mother awaited (in the front yard probably, hanging out laundry) ready to heal all wounds. The most bothersome of all the creatures were probably the tiniest. The humid climate of the subtropics provides a lush breeding ground for insects. I remember the images of dragonflies performing their mating dance above every still pond or puddle; horseflies, yellow-flies and mosquitoes swarming brazenly at early nightfall (well-tutored in the clever art of gliding in on every unguarded centimeter of flesh); and brown bats diving for supper up and down the dirt roads and alleys. The woods were rich with life. At night the songs of crickets, toads, cicadas and owls would rise up and harmonize with the rolling melodies of the Gulf, bringing to full gestation every wild dream in a young boy’s head, until the weariness of the day’s activities would inevitably pull him down toward other dreams. As for the thunderstorms! Well, you have to have witnessed the power of a sudden Florida thunderstorm to fully appreciate the excitement and fury that a small storm, rolling up the coastline unannounced, can produce. You have to have known the experience of being half-asleep at daybreak, rolled up against the screen of the sleeping-porch, trying to catch the last few cooling breezes of the night, when the sound and brilliance of a lightning bolt suddenly strikes, sizzling and crackling it is so close, and then just a moment behind it comes the inevitable BOOM!, a sound not unlike a cannon going off inside your hallway. The air is so full of electricity you can feel it in you hair, and you pull yourself under whatever covers you can find and peek out just a little, listening, listening, hoping the next bolt won’t strike so close, but of course it does strike close – too close – and the thunder explodes into a series of ghostly reverberations, as though it were the voice of some long forgotten deity. The rain and wind will soon roll in behind the lightning and the storm will disappear as quickly as it appeared. The air will be suddenly cool, your bed more warm and inviting, and within minutes the lawn will be dry once more. There’s no place to hide, of course. You can only take a deep breath of the fresh air, roll over into your soggy pillow and say a prayer. Looking back, it would be hard to invent a more dangerous environment for an energetic and curious boy to grow up in. Yet, for all the perils, parents thought little of allowing their children to run un-chaperoned throughout the wildest reaches of Grayton, as long as they made it to someone’s house for supper, and headed for home when The Store closed. I guess we all looked after each other back then. Today, while mostly its the same kind of folk who wander the beach, it’s a different world. There’s hardly a chance you’ll run into a red-tailed fox sniffing at your campfire, or even that a stray skunk will chase all the neighbors indoors. And out beyond our house, where there used to be woods so thick you couldn’t travel through them, you see mostly backyards now, and beach homes. They are clearing land for new subdivisions every day. But civilization presents other dangers. We are more cautious these days, and suspicious. Times have changed. Of all that is unique and special about Grayton Beach, most first time visitors will remark about only two things: the sand and the water. The sand is most often described as sugary. It is an appropriate description for the sand is perfectly white and crystalline. The remains of quartz rock, pulverized to small grains by years of tumbling waves and blowing wind, the sand is deep and soft, so soft that bare feet will sink into it up to the ankle. Along the sides of the dunes the wind-blown sand is unpacked. As youngsters we delighted in jumping from the tops of eighty-foot dunes into the silky and sheltering cushion. Most of those dunes are gone now, bulldozed to make room for subdivisions, or washed away by hurricanes. About every couple of weeks, when the mood was right, the stars were aligned, and the driftwood had washed up providently, we’d pitch a bonfire out on the dunes. We’d usually place it in the bowl of four high dunes, or sometimes, if the wind was calm, out on the clear stretches of sand. Wherever the fire finally got lit, it would always attract everyone that had an eye for adventure or romance. A few adults would usually show up to keep things in order, organize the roasting of wieners and marshmallows and tell old stories, while the youngsters would race up and down the dunes, chasing every shadow and sound, leaving the teenagers to wander lustfully throughout the sea oats and shadows. Romance and wanderlust circled the bonfire like lightning bugs in a mating dance. No pollution or township light diluted the night sky. At midnight it was easy to lay your head back on the soft pillow of a nearby dune and marvel at the brilliant clarity of the Milky Way, so filled with starlight that indeed it looked milky, abandoning your wishes and cares to rise up with the spark and sparkle of the bonfire into the farthest reaches of the universe. 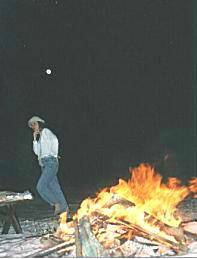 There was nothing more invigorating than the whispering rumors of a bonfire at Grayton Beach, nothing more encapsulating of the spirit that was The Beach. The sands along all beaches are restless; they are shaped by the wind and rain, growing vicariously with each seedling or stray log of driftwood. But along this stretch of Florida’s coast the sand is about as soft and white as it comes. Photographs of these beaches may resemble any number of landscapes, depending on the time of day and how the light hits the sand. Often the beach looks like a rolling field covered with deep snow, or occasionally – most often near sunset, when the light is full of reds and browns – the dunes could easily be imagined to exist on some distant, uninhabited planet. On this planet, however, there is probably no beach anywhere that has sand as pleasant and comfortable for the sightseer, the explorer, or the sunbather. It is mostly the sand people talk about when they use superlatives to describe Grayton Beach. Only the beautiful greens and blues of the Gulf of Mexico can balance such splendor. Like the welcoming sand, the waters of the Gulf of Mexico seem perfectly designed for any visitor in search of natural beauty and relaxation. The sea-bottom is made up of the same soft sand and it slopes out gently, so that on many days, if you hunt down the right sand bar, you can walk out a hundred yards or more. The waves are almost always mild, a drawback if you’re a surfer, but a wonderful benefit if you have children to keep track of. The Gulf waters pose few hazards to children or adults alike. Worst you can point out are the little fish that insist on nibbling at your toes in the shallow waters. Though sometimes seaweed will drift in with the Gulf stream (usually its a green, rather slimy variety, or perhaps sargassum seaweed) mostly the water is crystal clear. At midday the Gulf water is a brilliant emerald color which fades into a deep blue as the water deepens. The light surf rolls in quietly, providing a modest background roar, just audible at every reach of Grayton Beach, a reminder to everyone to slow things down, and whatever project you were thinking about, it can wait a little while. This is a little of what I remember about the most beautiful beach in America. There are a hundred stories for every tale that is told, but they’ll have to wait for now. For me, the memories are timeless. In my life I’ll always hear the light whistling of the Gulf as it splashes in the distance from where I lay curled up on a flimsy bed near a flapping screen. And I’ll always hear the sound of footsteps racing across the sandy wood floor of The Store. And late at night, fresh out of a dream, I’ll suddenly remember my childhood, and I’ll hear the sounds of crickets and toads in the woods, singing to me of romance, beauty, and the vanishing wilderness.